Somehow the combination of Primus and Charlie & the Chocolate Factory seem like the perfect idea. You have a bizarre movie and a band that can be equally bizarre. It seems like a natural fit. 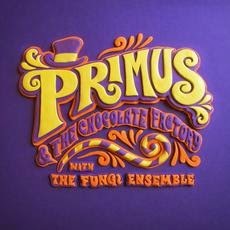 So it should be no surprise to anyone what the forthcoming album (out October 21st), Primus & the Chocolate Factory sounds like. The album was conceived as an homage to the 1971 Gene Wilder version of the film. As such, the band put their own spin on the songs featured in the movie. Only Primus sounds like Primus (okay, there are some instances when they stray close to Tom Waits), so you know what you're getting when they unleash songs like the clanky "Cheer Up Charlie". Their take on the classic "The Candy Man" is a choppy fits and starts event that will keep you on your toes. "Pure Imagination" sounds as though it's been turned inside out on itself. Middle Eastern rhythms take the lead on "I Want It Now". The Oompa Loompa songs are possibly the most true to the film soundtrack. Of course, it would be hard to get much weirder than they already were. Strangely though, the really creepy "Semi-Wondrous Boat Ride" is actually less creepy in Les Claypool's hands. This isn't an everyday record though. It is a concept album at the very least. In fact, it may be edging dangerously towards novelty territory. However, fans of the band and the movie should at least give it a listen. Best tracks: "The Candy Man", "I Want It Now"